GoPro introduces new Trim + Share feature for Cameras and GoPro app. GoPro has released a new feature that further enables users to effortlessly share their memorable moments captured on its GoPro devices. This smart new feature allows the user to create short video clips directly on the camera or mobile device for easy sharing. Simply press the Trim icon in playback mode, choose a 5-, 15-, or 30-second clip from any of your recorded content, and save it for sharing, all without transferring entire video files. 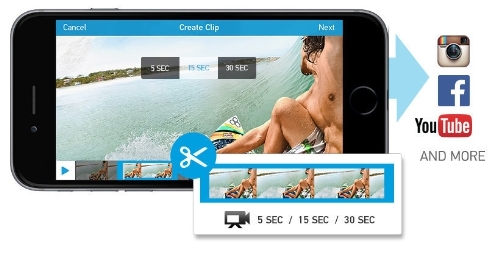 New functionality makes it easier to create and share short videos minutes after the moment happens. On-camera trimming, available on HERO4 Black with LCD BacPac, HERO4 Silver, and HERO+ LCD, allows you to save your trimmed file directly back onto the memory card, adjacent to the rest of the video files for later sharing. As well, the in-app functionality will allow for instant saving to your camera roll and very precise trimming from all Wi-Fi enabled GoPro cameras. In order to focus on the run, the set wave, the trail in front of you, typically you would just press record and allow the GoPro to catch everything. However, if you caught some epic content during that session, you may want to set it aside or share it to the world as soon as you stop recording. Before, that required you to download your footage to your computer, find your best moment, edit a clip, export and upload it. With the new Trim and Share feature, you can select that climactic moment on your mobile device and upload it to Instagram.